The ARENA political party, which had governed El Salvador for 20 years from 1989-2009, today voted to expel from its ranks former president Tony Saca, who left office just 6 months ago. 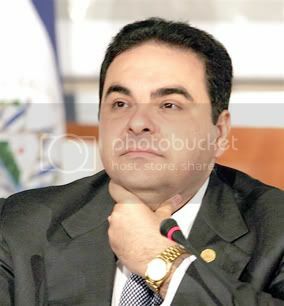 Former president Alfredo Cristiani announced that Saca was expelled for betraying the principles of the party, including instigating the recent defection of 12 ARENA deputies in the legislature. The party blames Saca for hand-picking Rodrigo Avila as its 2009 presidential candidate, and then losing to Mauricio Funes in the March presidential election. Meanwhile, the conservative El Diario de Hoy, has published an investigative report revealing that Saca's presidential office spent $219 million more than was budgeted by the National Assembly. The spending by the presidency was out of proportion to all other sectors of the Salvadoran government -- Saca's spending on goods and services was greater than the spending of the ministries of health and education combined. While the ministry of health was running out of money for medicines in the hospitals, Saca spent $83 million on publicity for his presidency. BREAKING NEWS!!! El Diario de Hoy is two years behind the rest with their breaking news! What will they tell us next with their investigative reporting? Will they tell us that Mauricio Funes became the fist left wing President of El Salvador? Or that Twelve Angry Men left ARENA because they wanted justice? El Diario de Hoy is more than a $5 circus; those clowns know how to do editorials...but when it comes to manipulating the public they put up a great show!! Where were they when all of this curruption from ARENA was happening? El Diario de Hoy didn't say anything about ARENA, except that ARENA was great!! !FMLN bad!! !ARENA patriots...FMLN Chavez...ARENA christians ...FMLN bad people!!! Since COENA, and El Diario de Hoy want to wash their hands of it...and purify their 20 years of corruption by scapegoating one of the best Presidents of El Salvador, the witch hunt for the turk will continue. The FOX news of El Salvador, El Diario de Hoy(EDH) is nothing more than another tool for desseminating missinformation coming from the RIGHT.One example comes to my mind; when a new administration comes to power they want their people to take some key jobs possitions,as embassies,as administration, etc...the EDH had in their front page " Ola de desempleos" refering to the administration right to change the people as they wished. So, to me, the breaking news about Presidente Saca is not breaking news, as to El Diario de Hoy timing for their breaking news.!! I thought CoLatino's headline today allows us to take a step back and look at the big picture: "Los asesinos siguen en la impunidad" ('The assassins still live in impunity' -- with respect to the architects of the El Mozote Massacre, which passes through another anniversary without justice). ARENA expels Saca, but clings to D'Aubuisson. If there is going to be an ARENA purge that "purifies" the party, um, this ain't it, folks. Hola que tal, soy Alejandro Solorzano , Te interesa poner anuncios de texto en tus blog. Puedes ganar hasta 50 euros AL MES por cada blog o web. Le rogamos nos remita los blogs , para poder revisarlos y cualcular el nº de entradas aceptadas.